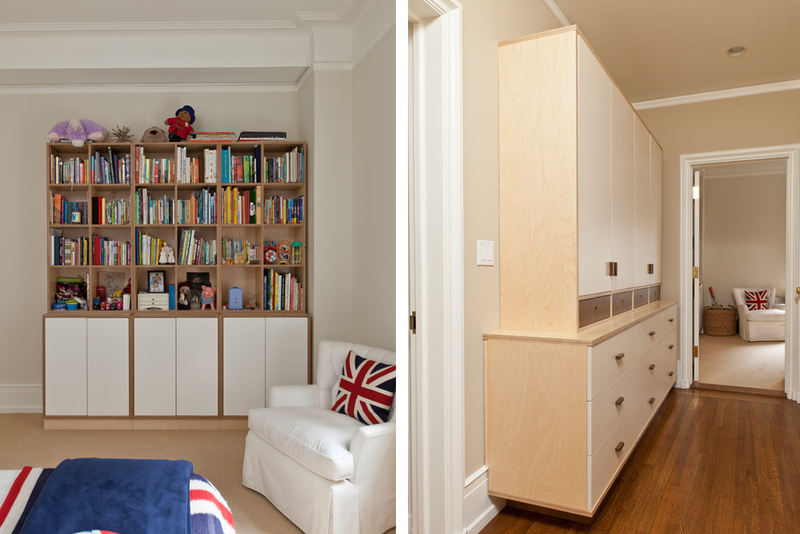 Kate and Will's Rooms: Two rooms, two storage beds. Will and Kate’s rooms are adjoined spaces throughout which we created both a sense of cohesion and separation. Kate’s room reflects the aesthetic of an older child, featuring a natural finish complemented by white accents throughout the room’s central fixtures, namely a full size bed, nightstand, armoire and storage unit. Kate's bed (pictured below) is equipped with loads of storage space courtesy of the drawers we installed beneath the platform. A white poster headboard coordinates with the clean white accents throughout the armoire and nightstand. No existing closet existed within the space, so we designed a wide armoire featuring both drawers and hanging bars for storing clothes. By utilizing touch latches, we were able to maintain flush cabinet doors that are both sleek and functional. Along the wall opposite the armoire, we installed a highly modular storage unit with open shelving, as well as expansive cabinet space, the doors of which are equipped with touch latches. The overall layout was designed to maximize the available light from the room’s two windows. We solved the challenges presented by Will’s much smaller room and his need for ample shelving (Will is an avid reader) by installing corner shelving units that fit snuggly into the existing wall configuration. As with Kate’s bed, Will’s is equipped with storage drawers beneath the platform, ensuring that clutter is easily kept at bay.